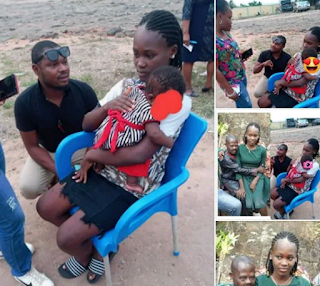 On Sunday 3-February, The Anambra State Ministry of Women and Children Affairs, said that it has received complaints about an alleged underage marriage involving a girl from Ihiala identified as Miss Chinwe, and a Physical Challenged man from Ozubulu, also identified as Mr Izuchukwu Igwilo. The statement was signed by Lady Ndidi Mezue, the Commissioner, Anambra State Ministry of Women and Children Affairs, said the ministry is following up on the case as it continues to collaborate with several persons and organisations including security agencies towards quick resolution. "The ministry is in contact with the girl’s family, Anambra Police and other interested parties in the matter including human rights activists," the statement reads. "The ministry’s utmost concern at this period is the safety and well-being of the young girl in question, as well as the well-being of her young child. As a result, the ministry has up till this time not made any press statement, granted any media interviews nor released any pictures concerning this matter, this is to protect the dignity and privacy of the innocent persons involved. We call on all those working on this case with us to toe the same line. We wish to assure the public that in line with our mandate, and as can be seen in previous social welfare interventions undertaken by the Ministry, we will pursue this particular case towards achieving a satisfactory and positive outcome.